This version includes In Vitro Diagnostics (IVD) compatibility. The three-phase filtration of this build breaks sluice down into its component solids, liquids and gasses. 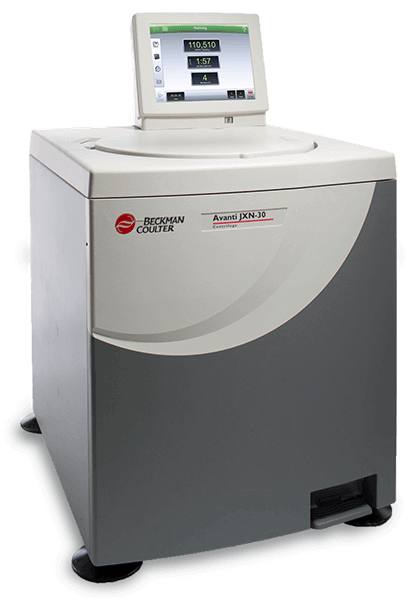 Now you can address the challenges of a shared lab head-on with the JXN 30 IVD Three-Phase Centrifuge. With all the applications of a floor-standing centrifuge, the JXN-30 features a rotor speed of 30,000 RPM and RCF greater than 100,000 x g. It’s compatible with an expansive library of rotors, including fixed-angle and swinging bucket options. Exceptional performance, improved BioSafety and advanced levels of networking can help you master daily lab challenges and achieve the throughput you need for shared labs, GMP environments and networked instruments. Includes data logging and real-time run graphing functionality. Via network or mobile device, the MobileFuge app adds the ability to access and monitor data remotely, manage permissions, address error handling and more. Stores up to 1,000 user-defined programs and up to 50 profiles.